The Amazon is likely to face continued warming in addition to possible multiyear droughts, a new study finds. The research suggests that primary ecosystem services—biodiversity, water cycling, carbon capture and others—are at greater risk than anticipated. Adaptive management strategies may be required to safeguard these key benefits of the rainforest. 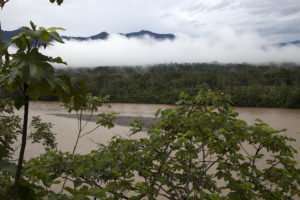 Prior research has shown that background climate is one of the variables most responsible for the Amazon rainforest's sustainability. However, existing climate records for Amazonia only span the last few decades. The new study's authors—from Arizona, Michigan, Florida and Costa Rica—used sediment from a rare lowland lake in western Amazonia to generate an approximately 1,400-year paleohydrological record, shedding new light on the range of drought this vegetation might have to endure. "Resource managers may be planning for future droughts similar to those they have recently experienced—isolated seasonal dry periods lasting a few months," said Luke Parsons, a postdoctoral fellow at the University of Arizona and first author of the study, which was published online May 24 in Water Resources Research, a journal of the American Geophysical Union. "Our work suggests that there is a possibility for even longer droughts, perhaps lasting multiple seasons or years, setting the stage for fires that could clear swaths of the rainforest," he said. Parsons and colleagues used core samples from Lake Limón, on the western edge of the Amazon Basin in north-central Peru, to construct a record of elemental abundance, which they interpreted as a proxy for western Amazonian precipitation. "Drought variability in the Amazon is much greater than currently thought," said Jonathan Overpeck, dean of the University of Michigan's School for Environment and Sustainability and another of the study's authors. "Whereas the longest drought in the rain-gauge record is a year, the paleoclimate record shows that droughts of many years—and even some that span more than a decade—have occurred in the recent past." The paleohydrological record identifies 31 dry periods over 1,400 years, roughly double the number simulated by climate models over a similar time period. Over half the paleo-inferred drought periods last more than seven years, whereas climate models and the instrumental record rarely, if ever, show droughts lasting this long. "Climate change only makes the forecast worse," Overpeck said. "Future multiyear droughts will be hotter—and thus more severe—than in the past. And with the Amazon's growing population, wildfires become a real threat during times of drought. We hope that forest managers can better prepare for these scenarios when they know the long-term drought history of the region."